on February 28, 2014 in Erie. 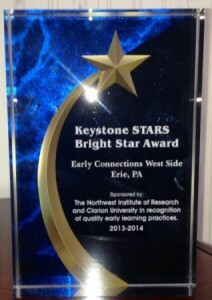 Under the direction of Stephanie King, Early Connections-West Side was nominated for its strong partnership with the City of Erie School District and the Northwest Tri-County Intermediate Unit’s Early Intervention Program, as well as for its voluntary participation in the PA Keys’ Family Focus Group Project. Congratulations to the entire West Side staff, especially Stephanie King, and executive and associate directors Nancy Kalista and Darlene Kovacs for a job well done, as well as to Early Connections-West Side’s preschool children who played a big part in the ceremony. Special thanks also to Senator Sean Wiley and Representatives Pat Harkins and Flo Fabrizio, NWIR CEO Joyce Miller, Vice President Tania Bogatova and NW Regional Key Executive Director Elana Como for participating, and for Senator Wiley’s presentation of a legislative citation on behalf of the PA Senate.